Sometimes, a good documentary is all about being in the right place at the right time. It does not get much better for Kim Bartley and Donnacha O'Briain, who, in late 2001 began filming a documentary about Hugo Chavez, the controversial President of Venezuela. As they worked on their documentary, events in Venezuela reached a fever pitch and the duo was able to capture on film a coup from the perspective of the Chavez government. The footage is remarkable, especially given that actual events were so clouded by propaganda on both sides. What is clear is that this was a coup orchestrated with the crucial help of the media. Without their support, it would not have been successful. Venezuela occupies a unique political place, especially for the United States. It is one of the largest oil producers in the world, and not located in the Middle East. The US views it as a strategic partner, able to serve as a counterpoint to some of its fellow OPEC members. It's also a poor country, with oil a major source of revenue. Chavez came to power democratically promising to redistribute the oil profits, understandably making the oil companies, supposedly under control of the State, nervous. Chavez was a huge proponent of education, and printed thousands of copies of the Venezuelan constitution and encouraged citizens to study and understand it. 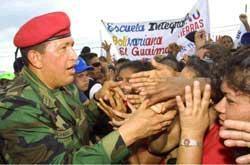 In late 1991, Chavez decided to act on his promise to redistribute oil wealth, throwing his country into turmoil. Venezuela had one state controlled television station, and nearly ten others controlled by various media corporations, all of whom vehemently opposed him. Bartley and O'Briain originally intended to make this a documentary about Chavez himself, who portrays himself as something of a savior. They got too close to him, and it is very obvious they are on his side, at least in terms of the coup. Nevertheless, with some of the evidence they present, it's hard not to believe them. Chavez's decision made the US extremely nervous. A shift in power of oil control within the country meant uncertainty, something that's never good especially when dealing with a commodity like oil. The media portrayed Chavez as unstable, resulting in a huge rally that eventually led to Chavez's headquarters. Shooting erupted, which the media blamed on Chavez supporters. The army came in, and a coup ousted Chavez. The media continually played footage of Chavez supporters firing, supposedly into crowds of anti-Chavez citizens, yet Bartley and O'Briain obtained spectacularly damning footage shot from a different angle that shows empty streets below them. With the army in charge, Chavez's cabinet was dissolved, and they lost control of state run television. The world was told by the new President, Pedro Carmona, that it was a popular and democratic uprising, but the documentary posits otherwise. It's pretty convincing material. Some believe that the coup was orchestrated with the help of the CIA, to ensure that oil would flow continuous and cheap to the United States. There is footage of various US officials expressing concern over the events, and footage of ex-White House spokesman Ari Fleischer echoing Camona's assertion that this was not a coup. Events over the next two days would call this into question, as the Venezuelan government undergoes another upheaval. What happens is so quick and amazing that it feels like something dreamed up in a political thriller, but it actually happened, and was captured on film. The difference with this film is that the filmmakers were, in essence, trapped inside with the Chavez government, so they were able to get a wholly different viewpoint on the explosive situation. Chavez the person still remains elusive, as there is only one segment where he addresses the camera and talks about his personal history. The only real shame in all this is that this documentary is so short. With so much footage, there was surely more that was available. Mongoose Rates It: Really Good. 1 hour, 14 minutes, English and Spanish with English subtitles, Not Rated but contains some language and violence, an R or possibly a PG-13.